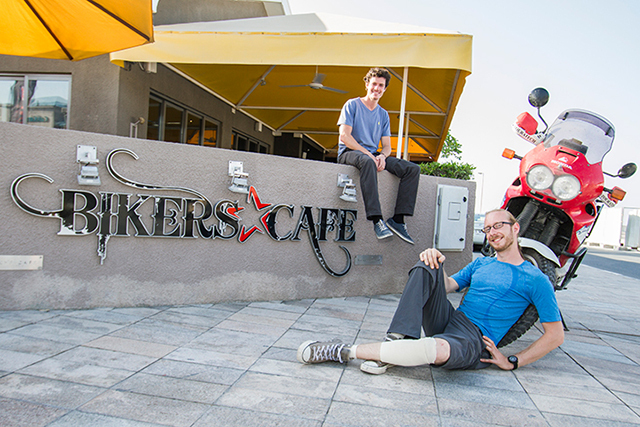 We just had two awesome riders over at Bikers Café, Manuel Kolloff from Germany, and Martin Moyano from Argentina. Like most of us, Martin had always been dreaming of travelling around the world and exploring new places, in fact for the last 20 years, and it was only recently that he got to fulfill his dream. Starting from March 2014, the Argentinian has been on the road for nine months, travelling around 65,000 kilometres. Manuel also had a similar vision to see new places and interact with different people and diverse cultures. He has been riding on his 2000MY Honda XRC 750 for around three months now, starting from August 2014 and has covered approximately 10,000 kilometres. The duo met in Iran and, for the last two weeks, have been riding together. The coming weekend, however, will see Manuel and Martin go on their own separate routes. Though both of them do not have any sponsors, things have been more or less okay till now. Martin faced a small issue when a mechanic in Bolivia messed up his 2012MY KTM 990 Adventure, but nothing serious. He was staying in Dubai for two weeks, and will be flying to India this Saturday. Similarly, Manuel also had a more-or-less smooth patch, except for a minor leg injury during an off-road bike ride in Dubai. With Manuel waiting for the injury to heal, we’re not sure as to how long he’ll be staying back. Interestingly, both riders feel that their current steeds are quite heavy for these kind of trips and, from their experience, collectively agree on settling for lighter bikes with minimal luggage in the future. While Martin has high regard for the Hungarian Goulash that he had in Australia, Manuel doesn’t have any particular favourites. He had been to just Iran and Turkey till now, but he likes the variations and the differing styles of eating, including sitting on the floor. The pair was impressed with the food and the atmosphere at Bikers Café, and promised to return in the near future. Bikers Cafe turns 6 on the 6th of MAY!